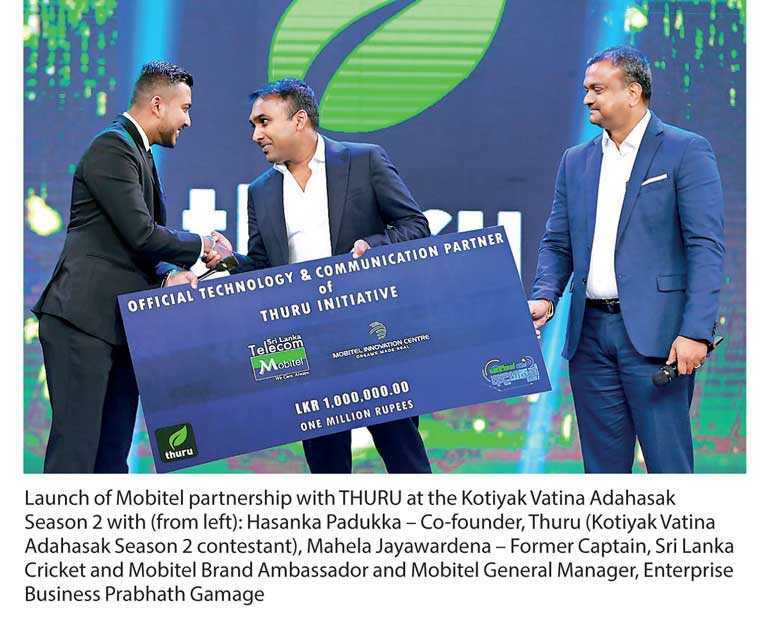 Glimpsing joint synergies and strong potential for collaboration, Mobitel is poised to work together with THURU, one of the 10 finalists of the Season 2 of Kotiyak Vatina Adahasak, Sri Lanka’s first-ever innovation and entrepreneurship based tech reality TV show powered by Mobitel. Mobitel conceptualised this program, which was produced and aired on Sirasa TV. Mobitel and Thuru will work in collaboration with each other to take THURU to the next level through co-creation and co-innovation. THURU is a digital inclusion reforestation drive initiated from Sri Lanka with a mission to plant two million trees by end 2020. As the technology partner for THURU, Mobitel will provide technical consultation to the THURU team, mainly in the domains of NBIoT (Narrow Band Internet-of-Things), Blockchain and Artificial Intelligence to make the system futuristic and intelligent. As the National Mobile Service Provider, Mobitel has taken on the mantle of a mentor to nurture tech entrepreneurs and innovative startups that can succeed as successful businesses. Through this collaboration, Mobitel plans to conduct a reforestation drive targeting the entire country and will reveal the details in the near future. THURU holds the potential to be introduced as a gamified platform for planting trees, where the process is driven through a mobile app, which is called “facebook for trees”. People can plant trees and upload images, details and the app will automatically generate points, and the person can climb up in the leaderboard as a true nature hero. The app will automatically count the oxygen output based on the type of plant and number of months/years of the tree. The longer the person takes care of the tree and uploads images, the more points he gets. It will be a guide to tree planting and will help users link up with like-minded nature lovers and tree huggers across the globe. THURU also carries out a reforestation/planting project around the country. Interestingly, they are always introducing technology into the process with initiatives such as using drones to successfully reforest a large area within a short period despite the difficult terrain. Mobitel, under its credo, ‘We Care. Always’, is focused on environmental and social responsibility initiatives and this collaboration provides an ideal balance of both technology and greening, while engaging the larger community to become conscious of the need to reforest Sri Lanka for future generations. Mobitel is continuously supporting and encouraging tech entrepreneurship in Sri Lanka, through many initiatives, to offer encouragement for innovators.